Given by Dr W.L. Hildburgh FSA. 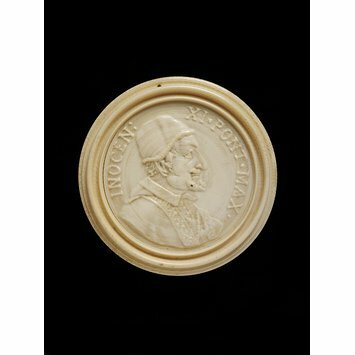 This portrait of Pope Innocent XI (1611-1689; Pope 1676-89) is similar to that shown on the 1679 bronze medal by Giovanni Hamerani (1646-1705), although on the medal the Pope is shown with full papal vestments and with longer hair; in addition his abbreviated name is given as 'INNOCEN' with two 'n's (examples are in the present collection, including inv. no. 1247-1893, and at the British Museum and elsewhere). The virtuoso skill seen here, whereby a figurative portrait is created using only the technique of turning, was greatly admired in the seventeenth century. The turned portrait is set within an integral turned frame. The bust faces right, and the Pope is shown bearded wearing a cap. The medallion is inscribed. Given by Dr W.L. Hildburgh F.S.A. in 1949; formerly on loan from Dr Hildburgh.